A growing number of people nowadays are becoming concerned about healthy eating and dieting. Sadly, though, our hunger for good food in often misused by manufacturers, who are trapping consumers with misleading labels. One of the most common forms of confusion is caused by the fact that the actual package size is not the same as the serving size. “Pay close attention to the serving size. Often a food manufacturer will make health claims but alter the serving sizes to uphold them. Something that is generally consumed by one person will be listed as two servings,” said nutritionist Casie Terry, as cited by the Family Health Guide website. The foods, attractively labeled “low fat” and “reduced fat”, may still be high in sugar and other additives. Some sugars are disguised in the list of carbohydrate content as “dextrose”, “sorbitol”, “galactose”, “lactose”, “polydextrose”, “maltodextrin” among others. Foods with a label “no added sugar” may be still high in natural sugar, and thus their energy value doesn’t help to say “farewell” to extra kilos. The mark “natural”, while being one of the vaguest terms found on food labels, gives the impression that the food is healthy, when in fact the opposite may be true. Nutrition experts advise to simply ignore this term and take a look at the ingredients contained within the product. The term “light” gives consumers the impression that this product was lower in fat or calories than the standard food. In fact, the food may have only been lighter in colour or weight. 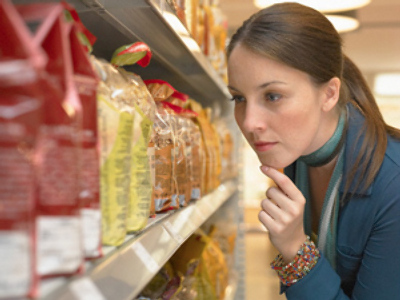 Manufacturers’ unjustified health claims are forcing the authorities to review the current system of the food labelling. “[Food labelling] terms are now tightly regulated by the recent health and nutrition claim regulations which are not open to interpretation. It is to be expected that brand owners will stick to the limits specified, but they also may ‘engineer’ products so certain claims like ‘light’ will apply. The task is therefore to ensure consumers now understand the rules and no longer need to crack down on misleading labels,” Dave Hill, Labeling Consultant at Food Label Check (in the UK) told RT. The problem of misleading food labels is not a UK-only problem – it is widespread in many other countries around the world. The US Food and Drug Administration, for instance, have decided to investigate the so-called “Smart Choices” program that was started by large manufacturers last year. The program uses green Smart Choice labels on the front of foods that are supposed to have met certain standards for calories per serving and fat content. As it turns out, the standards are not too exact, and have led to labels springing up on everything from frozen sweets to sugary cereals. “There are products that have gotten the Smart Choices checkmark that are almost 50% sugar,” FDA Commissioner Margaret Hamburg said recently. In Australia, nutritionists are anxious that many food labels aimed at children give nutritional information based on the recommended intake for an average 70kg adult male, which can be more than 25% higher than children should eat. In Australia, where one in five children and young people is overweight or obese, this misleading labeling is becoming a serious issue.